Whenever I tell a patient that they have a cavity (decay), they usually respond, “but I don’t feel anything” or “it doesn’t hurt”. Well, that’s usually a good thing because the chances are if you feel anything such as cold or more so hot, you need more than just a filling…you need a root canal. So the strategy should be to get at the decay at an early stage (when it is just starting). The decay process is pretty easy to understand, but first a simple lesson in dental anatomy. Basically, the tooth is made up of two layers. The outer ‘protective’ layer is enamel. This is the part of the tooth that you see when you look in your mouth. It is the hardest substance in the body (see ‘Let’s get to the root of the problem- part 2). The next layer inwards is dentin. It is softer than enamel and contains the channels that emerge from the central nerve (pulp) of the tooth. One of the more common places to get a cavity is in the back teeth. 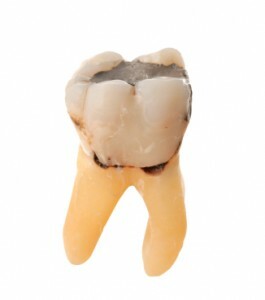 The molar teeth have many deep pits and grooves which are susceptible and prone to accumulating plaque. Plaque consists of a multitude of bacteria, so if the plaque just sits in the grooves of these teeth, a demineralization process begins and the enamel gets eaten away. Once the decay has spread to the inner soft layer of dentin, the progression of the cavity is much quicker. As the decay approaches the central nerve of the tooth, this is when you start to feel sensations…first to cold and then to hot. As mentioned previously, when you have sensitivity to hot, this is because the central nerve (pulp) has become infected. It’s the nerves way of saying ‘things have gotten a little out of hand’. 1) On an x ray it looks like a small dark shadow. 2) Clinically (by checking in your mouth): when we place a pointy dental instrument (called an explorer) into an area of decay it ‘sticks’ in to the tooth if there is a cavity present. It sticks in and there is usually some resistance to removing it. Where ever possible, I try to show the patient the decay that is present in their mouth. When I ‘drill’ in to the tooth and reach the area of decay I often take a photo of it with an intra oral camera. This is a small wand with a camera in it that takes a high definition picture which I can show to the patient on a computer. 1) What a cavity looks like. 2) What is wrong with an old filling and why it needs to be replaced. 3) Before and after pictures of their filling. It’s true: a picture is worth a 1000 words! In the next few entries, I’m going to provide you with some more information pertaining to the whole cavity process. It’ll be like the W-5 of dental decay…stay tuned! Are you experiencing tooth pain? Does it hurt when you chew? Are your teeth sensitive to hot or cold? If you answered ‘yes’ to any of these, you may have a cavity. To learn about cavity prevention and/or to find out if you have a cavity, give our dental office a call at (905) 791-3867 today.